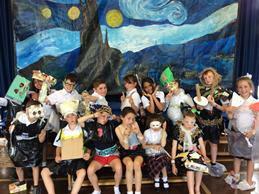 Year 4 have enjoyed taking part in lots of conservation themed activities. The highlight of the week was the fashion show which involved the children working in teams to design and make an outfit using recycled materials. They then had a catwalk show to display the outfits. The children had great fun and certainly showed themselves to be very creative- maybe we have a few budding fashion designers in our school!